Sisense Hunch™ is proving to be a valuable tool for customer-relationship intensive industries (e.g. Telecom, Retail, Banking, Cable TV, Automotive and Finance) to help them increase customer retention, reduce churn and build highly targeted data-driven campaigns even for anonymous customers (such as pre-paid customers). With Sisense Hunch, cable telcos can accelerate their analysis of customer behavior, with a view to identifying and preventing loss of revenue owing to customer churn and subscription cancellations. Sisense Hunch has hugely enhanced our decision-making as it enables us to check hundreds of scenarios interactively in real time with great accuracy. Telecom companies face a growing phenomenon of cord-cutting that they want to pinpoint and prevent. Cord-cutting involves customers canceling subscriptions or other services that are available over cables, mostly among Quad-play customers. It’s a phenomenon that has significantly grown in recent years owing to the introduction of new over-the-top (OTT) content providers such as Netflix, Amazon Prime, YouTube, Hulu and others. These Internet-based services are cannibalizing the traditional Pay-Tv offered by telecom and cable service providers because they are either free or significantly cheaper than accessing the same content provided via cable. In many cases customers maintain their mobile and broadband services but disconnect the cable-TV and their land-lines. They are motivated to do so by the combination of price considerations, fewer intrusions from advertisements, faster and wider broadband, and the simple freedom to choose between viable alternatives. The impact on telecom operators is significant. Take, for example, an operator with 20 million households and more than 50 million lines in total. Cord-cutting was estimated to reduce each household’s bill by 39% ($80) compared to those that kept all the services. That’s a huge potential loss of revenue and profit and a huge incentive to stop or even reverse this trend. The challenge is to identify potentially wavering customers as fast and as early as possible among the millions of customer accounts so that action can be taken to keep them loyal. 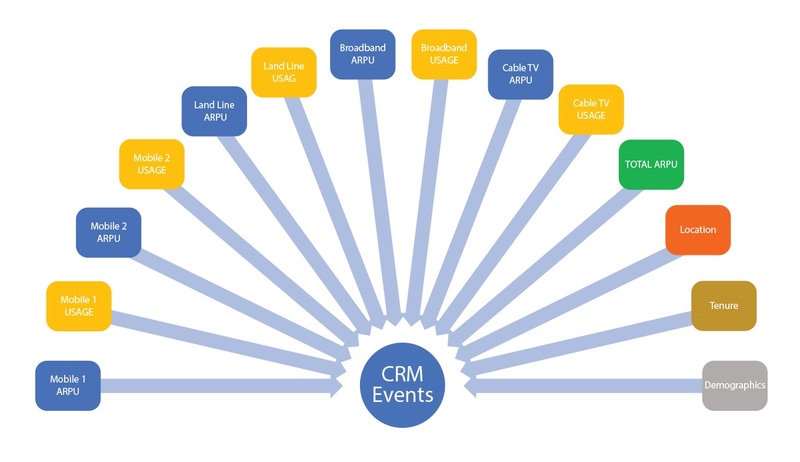 it’s necessary to calculate and track the number of CRM events and act accordingly. Speed is imperative to this data digging. The faster these behavior patterns can be identified, the faster they can be addressed, and it increases the possibilities of mitigating customer churn. 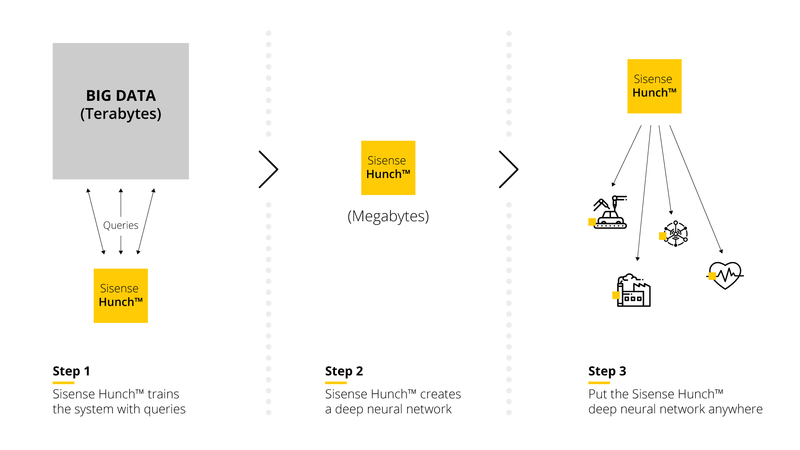 Sisense Hunch generates a deep neural network that learns to understand the data created by CRM events. This requires bringing together a wide range of data, including mobile and land-line identification, usage details and ARPU for these and other sources such as broadband availability and cable TV. That’s a massive amount of information to gather and analyze when the need is to do so quickly. In one particular example, Sisense Hunch reduced the dataset from 10 GB to 2 MB, enabling hundreds of scenarios to be interactively checked simultaneously, with each one taking just 10 milliseconds. Sisense Hunch proved to be 50,000 times faster than the previously used statistical product, which took more than eight minutes to check each scenario. Speed didn’t compromise the quality of the results either. Sisense Hunch achieved a 99.5% accuracy. In short, Sisense Hunch dramatically accelerated the ability to identify on-the-spot potential cord-cutters, suggest an offer they couldn’t refuse, and prevent or minimize ARPU-churn. By compressing terabytes of data, Sisense Hunch enables telcos to most rapidly meet their need to prioritize data and it provides clear and immediate targeting of groups and results in real-time. It maintains high levels of accuracy whilst avoiding any breaches of policy, privacy, and regulatory compliance concerning the use of raw data. Furthermore, Sisense Hunch’s API can be exported to any campaign management or CRM system, and the results it generates can be used by departments other than marketing, thereby adding value to the ROI.